No Implied Override Was Found Appropriate By Appellate Court. Plaintiff brought a Cartwright Act lawsuit against 11 defendants, some of whom were partially successful on anti-SLAPP motions—with the SLAPP statute allowing for mandatory fee awards to prevailing defendants. The rub here was that the Cartwright Act only has a unilateral fee-shifting provision in favor of prevailing plaintiffs. The trial judge decided that the Cartwright Act did not override the SLAPP fee-shifting statute, granting one defendant $23,120 in SLAPP fees which was the subject to an appeal. The First District, in Richmond Compassionate Care Collective v. 7 Stars Holistic Foundation, Case No. A154581 (1st Dist., Div. 2 March 15, 2019) (published), found no basis to disturb the fee recovery given that the Cartwright Act case principally relied on by appealing plaintiff was not a SLAPP action. It could find nothing to suggest the Legislature intended an implied repeal of SLAPP fee recovery even though the underlying substantive claim arose under the Cartwright Act. BLOG OBSERVATION—The merits of the case involved a medical marijuana collective permit which was lost by plaintiff; we assume with the legalization of pot that more cases of this nature will arise in the future. Even Though A Few Sliver Claims Remained, Defendants Prevailed Because Those Claims Are Not Subject To Fee Shifting. The Ninth Circuit, in an earlier appeal, had decided that plaintiffs’ claims for resale royalties under the California Resale Royalties Act (CRRA) largely were preempted by the 1976 Copyright Act for any claims occurring after January 1, 1978. However, they found some “sliver claims” were appropriate for dates before that 1/1/78 cutoff. Defendants then moved the Ninth Circuit for recovery of fees as the prevailing party on appeal under CRRA’s fee-shifting provision, California Civil Code section 986(a)(3), an application opposed by plaintiff. In Close v. Sotheby’s, Inc., Nos. 16-56234 et al. (9th Cir. Dec. 3, 2018) (published), the Ninth Circuit granted the appellate fee application, remanding to the Appellate Commissioner to determine the amount of fees under Ninth Circuit Rule 39-1.9. It rejected a number of arguments made by plaintiff to the fee application. It first rebuffed the argument that anything in the prior decision implied that the CRRA was null and void (and, hence, the fees clause also). It simply found most claims preempted, not that CRRA was “non-existent” such that defendants prevailed on the preemption argument. The Ninth Circuit next found that nothing in the Copyright Act preempted the CRRA fee-shifting provision, so that the defense again prevailed and was entitled to fee recovery. Panel Follows SoBreck, Choosing Not To Reconsider In Light of State Court Jankey Decision To The Contrary—Federal/State Conflict Exists Here. In Kohler v. Presidio International, Inc., Case Nos. 13-55808/13-56217 (9th Cir. Mar. 20, 2015) (published), a disabled plaintiff challenged certain checkout counters, dressing room bench, and blocked aisles in an Eddie Bauer Outlet store in Cabazon under the American with Disabilities Act (ADA) and California Disabled Persons Act (CDPA). Plaintiff did not prevail, although the Ninth Circuit vacated the defense ruling on the counters but affirmed the other rulings, including the district judge’s refusal to award attorney’s fees to defendant under CDPA (Civil Code) section 55—providing for fees for both parties. The Ninth Circuit affirmed, based on its prior decision in Hubbard v. SoBreck, LLC, 554 F.3d 742 (9th Cir. 2009), which held that section 55 was preempted by the ADA’s provision of fees for prevailing defendants only in rare circumstances not present in the case before the district judge. Eddie Bauer argued that this prior decision should be reconsidered and overruled in light of Jankey v. Lee, 55 Cal.4th 1039 (2012), which expressly disagreed with SoBreck. The panel rejected this invitation, determining that the CDPA-ADA conflict still existed, that Eddie Bauer relied on 2009 CDPA amendments which did not apply to section 55, and that Jankey accepted arguments which the Ninth Circuit declined to adopt. Decision May Have Implications for Application of CCP § 998 in Diversity Cases. An important decision for federal diversity cases came out yesterday from the Ninth Circuit Court of Appeal, pitting F.R.Civ.P. 68 against a state pre-trial settlement scheme in Arizona. In Goldberg v. Pacific Indemnity Co., Case No. 09-16243 (9th Cir. Dec. 6, 2010) (for publication), the appeals court determined that Arizona Rule of Civil Procedure 68 was “trumped” by Federal Rule of Civil Procedure 68. The winning defendant made a FRCP 68 offer for $1.25 million that was not accepted, even though the defense later won a summary judgment on plaintiffs’ bad faith claim and defensed plaintiffs’ breach of contract claim. Arizona Rule 68, even more punishing than California Code of Civil Procedure section 998, allows recovery of expert witness fees and double costs to the winning offeror. The district judge denied the defense requests for recovery of these costs. The Ninth Circuit affirmed, finding that F.R.Civ.P. 68 occupied the field and did not allow for use of Arizona Rule 68 because (1) Federal Rule 68 applies to offers by defendants, and (2) the Federal Rule does not allow a defendant to recover costs when a judgment is entered in defendant’s favor. Along the way, the appeals court observed that F.R.Civ.P. 68 does apply to diversity cases in certain circumstances, but not others. This was one where it did and was effectively preemptive in nature. BLOG UNDERVIEW--Goldberg may have important implications for the application of CCP § 998 in federal diversity cases. We will have to see how this pans out in future evolving jurisprudence. First District, Division 4 Disagrees with Ninth Circuit’s Hubbard Decisions. Now, a California intermediate decision—Jankey v. Lee, Case No. A123006 (1st Dist., Div. 4 Feb. 5, 2010) (certified for partial publication)—has expressly disagreed with Hubbard II’s preemption finding, concluding that attorney’s fees are awardable to a prevailing defendant under section 55 without the more elevated ADA entitlement showing. That said and done, the $118,458 (out of a requested $129,264) fee award was affirmed. In an unpublished part of the decision, plaintiff challenged the reasonableness of the award. However, his challenges did not persuade the appellate court. Contrary to his argument, detailed billing records are not required to affirm a fee award, with attorney testimony on the number of hours expended being sufficient in the right circumstances. (Martino v. Denevi, 182 Cal.App.3d 553, 559 (1986).) Attorneys’ claimed hourly rates—with the lead attorney asking for $165—as well as distribution of work (lead attorney worked 76% of the claimed time)—were found reasonable given the low sought-after hourly rate for the San Francisco legal community and the relative complexity of the case. 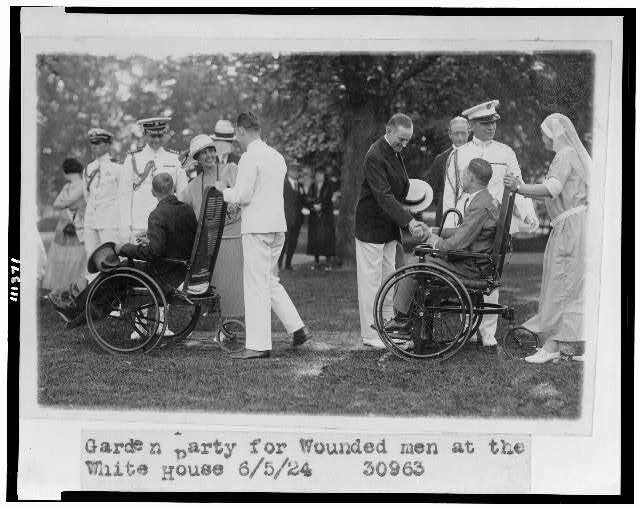 President and Mrs. Coolidge with their military aides, greeting two veterans in wheelchairs. Third District Finds Miller Rule Also Applies to Prevailing 998 Defendant. In Miller v. Union Pacific Railroad Co., 147 Cal.App.4th 451 (2007), the Third District Court of Appeal decided that the availability of expert witness costs in a Federal Employers Liability Act (FELA) action involving an injured railroad employee filed in state court is a substantive issue controlled by federal law. Miller involved a prevailing plaintiff who normally would have been entitled to costs after beating plaintiff’s own 998 offers; however, federal law did not allow for recovery because F.R.Civ. P. 68 (998’s federal counterpart) only applies to defense offers that are rejected under certain conditions. However, does the same rule apply to prevailing defendants? Yes, it does, the Third District recently decided in Kinsey v. Union Pacific Railroad Co., Case No. C056561 (3d Dist. Oct. 9, 2009) (certified for publication). Federal Court of Appeals Sustains $180,029.50 Fee Award to Tenants. In Barrientos v. 1801-182 Morton LLC, Case No. 07-56697 (9th Cir. Oct. 9, 2009) (certified for publication), tenants won summary judgment and permanent injunctive relief with respect to illegal notices of eviction served by a landlord arguing that Los Angeles Rent Stabilization Ordinance requirements governing such notices were preempted by HUD’s “good cause” regulation in 24 C.F.R. section 982.310(d)(1)(iv). The district judge also awarded tenants $180,029.50 in attorney’s fees based on fees clauses in the leases under California Civil Code section 1717(a). Landlords appealed. The fee awards were affirmed. The leases with fees clauses were hardly peripheral to the dispute, ruled the Court of Appeals. The merits issues concerning all tenants were so factually interrelated such that no apportionment could be practically carried out. No evidentiary hearing on the fees issue was required because landlord failed to challenge the reasonableness of the sought-after fees. Finally, landlord waived the argument that the Legal Aid Foundation of Los Angeles was not entitled to fees because of a statutory prohibition on such fees (see 45 C.F.R. section 1642.3), because the issue was not raised before the district court. Ninth Circuit Reverses Denial of Fees Award, Remanding for A New Look in COGSA, Bill of Lading Case. So what happens when you have a seemingly statutory choice-of-law clause (that means no attorney’s fees) and a contractual clause (that may mean attorney’s fees) in the same case? Well, if you are the litigant arguing for a fee award—argue that the contractual clause governs. That is what the litigant argued in the next case did and—wonders of wonders—it obtained a reversal of a fee denial on appeal. The case is APL Co. Pte. Ltd. v. UK Aerosols Ltd., Case No. 07-16739 (9th Cir. Sept. 21, 2009) (for publication), which involved a bill of lading governed by Singapore law and the operation of the Carriage of Goods by Sea Act (COGSA). The district judge essentially held that COGSA was the governing choice-of-law provision in a bill of lading that “preempted” a fees clause applying Singapore law (which adopted the English Rule that the prevailing party wins). Federal law generally does not permit the prevailing party in an admiralty case to recovery attorney’s fees. (B.P.N. Am. Trading, Inc. v. Vessel Panamax Nova, 784 F.2d 975, 977 (9th Cir. 1986).) However, notwithstanding this rule, admiralty courts will generally give effect to a contractual agreement that holds otherwise. (Chan v. Soc’y Expeditions, Inc., 123 F.3d 1287, 1297-97 (9th Cir. 1997).) Because the contractual bill of lading clause specified Singapore law (winner obtains fees) and Singapore law was the proper choice of law over COGSA, the matter had to be reversed and remanded for a calculation of fees due to the prevailing party. ADA/CDPA Preemption Decision Is Amended Based on Later State Court Decision, With No Change in Result. In our July 3, 2008 post, we discussed Hubbard v. SoBreck, LLC, Case No. 06-56870 (9th Cir. 2008), which held that an award of attorney’s fees to defendant under the California Disabled Persons Act was preempted by the federal American with Disabilities Act having more restrictive fee-shifting provisions. Award of Fees Under California Disabled Persons Act Preempted by Fee-Shifting Directives of Federal Americans with Disabilities Act. On June 30, 2008, Greg May, Presiding Member of The California Blog of Appeal, had a nice summary that he brought to our attention—and we HAT TIP him for that—of Hubbard v. SoBreck, LLC, Case No. 06-56870 (9th Cir. June 27, 2008) (published). We explore the decision further, but commend his synopsis to you. After a bench trial, a district judge entered judgment in defendants’ favor on plaintiffs’ claims brought under the Americans with Disabilities Act (ADA) and the California Disabled Persons Act (CDPA). ADA makes an attorney’s fees award to the prevailing party discretionary (see 42 U.S.C. sec. 12205), although courts have interpreted this to mean that fees are only assessed against plaintiffs who bring frivolous claims. CDPA, on the other hand, has a much more liberal fee-shifting provision, with California Civil Code section 55 providing that ‘[t]he prevailing party in the action shall be entitled to recover reasonable attorney’s fees.” Based upon this mandatory language in the California statute, the district judge awarded fees to the defendants. On appeal by plaintiffs, the Ninth Circuit reversed and vacated the fee award, finding it was preempted by the ADA. Because the ADA and the CDPA claims involved the same proof, the federal appellate court found that “it is impossible to distinguish the fees necessary to defend against the CDPA claim from those expended in defense against the ADA claim, so that a grant of fees on the California cause of action is necessarily a grant of fees as to the ADA claim.” The Ninth Circuit panel, in the 3-0 decision authored by Circuit Judge Schroeder, found that the state fee award (for bringing a nonfrivolous CDPA claim) was preempted by the ADA, which did not allow for a fee award for bringing a nonfrivolous ADA claim. The Hubbard court noted, as explained by Mr. May in his June 30 post, that several prior decisions had come to different results (or, in one case, a consistent result), but were not controlling because they did not even consider the preemption issue. Rather, it appears that the court in the unpublished decision of Wilson v. Norbreck LLC, 2007 WL 1063050 (E.D. Cal. Apr. 9, 2007) got the preemption analysis right. BLOG OBSERVATION—We would predict that either prevailing defendants may not be entitled to fee recovery or that state courts might apply the “pragmatic test” for prevailing party determination in line with what the Fifth District did in Brawley v. J.C. Interiors, Inc., 161 Cal.App.4th 1126, 1137 (2008). For an interesting discussion of the differences in fee recovery under the ADA, the CDPA, and the Unruh Act, see Justice Sills’ discussion in the unpublished decision of Gunther v. Chapman Plaza Associates, 2007 WL 1831114 (4th Dist., Div. 3 June 27, 2007) (unpublished).